Welcome to the website of Alex Bowler Evangelism, where Good News is guaranteed! May you be blessed and encouraged as you read about our evangelistic ministry and may you find peace with God through finding out about his Good News! Alex Bowler, was a Team Evangelist with The Evangelization Society (TES) from 1996 until 2004 and was appointed the TES Evangelist in the South West of England. From 2005 until 2012 he led the Alex Bowler Evangelistic Association (ABEA), an interdenominational evangelistic association. After seven productive years the ABEA came to end of its season and Alex Bowler Evangelism was launched. Alex was born in Matlock, Derbyshire, and moved to Somerset when he was very young. After completing his education, he sought to make a career as a musician and played bass guitar in various rock bands including McKenna's Gold, the band led by the legendary Scottish rock drummer Ted McKenna. Alex, who has been married to his wife Jill since 1995 , has preached the gospel in Europe, Africa and North America including New York city. He has also worked as a Team Evangelist with the Luis Palau Evangelistic Association in Bulgaria and Poland. As well as preaching to many thousands of people face to face and having the privilege of seeing many responding to the gospel of Christ, Alex, who has been described as 'a British Billy Graham', has preached to countless numbers of people in their own homes through his evangelistic films, which are shown on Revelation TV on the programme 'Be Encouraged'. 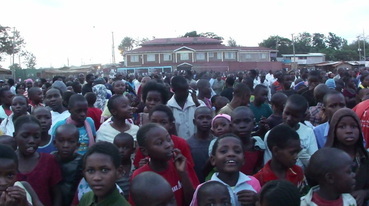 Whether Alex and his team are sharing the gospel of Christ through personal evangelism, on the streets in towns and cities in open-air outreach, in a gospel tent, in large-scale missions in a stadium or park, on TV or on the radio, the aim remains the same - to tell as many people as possible the best news in the world! ​Alex says: "It is my desire to work with Christian churches to see people won for Christ. Millions are lost, without hope in their lives. Jesus has not revoked the mandate to preach the gospel. The Bible says '...it pleased God by the foolishness of preaching to save them that believe.' The gospel of Christ works! accepted time; now is the day of salvation.' Are you ready? "